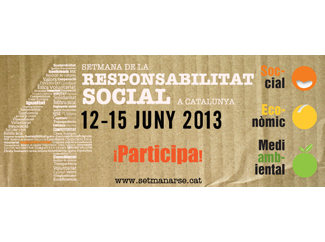 Humana attends the fourth 'Setmana de la RSC a Catalunya' for the purpose of raising awareness of the work being carried out in the area of ? ?social responsibility: the Foundation gives companies who want the opportunity to participate in their programs development cooperation and environmental protection through various initiatives. The main objective of the Setmana de la RSC, according to its organizers, is to promote the awareness of society about the social responsibility of the company, responsible consumption and the environment. The event program includes the following activities: on Wednesday June 12 at the Palau Reial Major, the lecture series 'SOC-ECO-AMB', around the three areas of sustainability: social, economic and environmental. Human participates as a speaker in the 'ECO', with ASM and Idaccion, the conference scheduled Wednesday between 10:30 and 11:15, in order to show the bridges established between textile and recycling social responsibility. The title of the presentation of the Foundation is "The textile recycling as a driver of social projects". On Wednesday conferences also take place 'Territoris', which will display innovative experiences in relation to social responsibility in the field of socially responsible territories. It then takes the Dynamic Fair CSR best practices and networking. On Saturday is reserved for corporate volunteering, while during Sunday different entities related social and environmental organizing an open day. Humana offers a chance to visit his plant classification of L'Ametlla del Vallés.